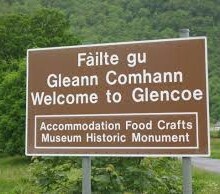 When you see a Gaelic place name or the name of a hill, loch or glen, do you try to pronounce it an find out what it means, shudder and just make a guess, or ignore it completely? So many of the names are descriptive of the area. or tell a little bit of history of the place that it really is worth making an effort. There are still plenty of signs of the old Norse names around too, roughly in the proportion of two Gaelic names to one Norse name in the north. 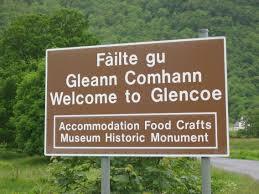 Sometimes a name is made up of a word from each language, for example ‘Glendale’ – ‘dale’ being a Norse name with the same meaning as ‘glen’ (Gleann in Gaelic). A good way of getting around and getting to know a place is by bicycle. Then there is plenty of time to look at the signs and your map along with any local booklets and see what you can learn for yourself. Aird dhobhar Ardgour, the promontory of the water. Also sometimes thought to mean ‘the height of the goats’. Baile a’Chaolais Ballachulish, the village of the narrows. Beinn na Caillich The hill of the old woman. These two mountains are on the North side of Loch Leven. Bunree The bottom of the River Ree. Camus a’Chòis The bay of the nook. Camus na h-Eirbhe Camusnaherie, the bay of the boundary wall. Caolas ‘ic Phàdruig The strait of Peter’s son. Cair Innis Cairnis Carness, the rough meadow, Cathar, a peat moss, also rough broken ground. Clach a’Charra The Stone of the Rock. It is near the shore at Onich. Clach Phàdruig Patrick or Peter’s stone, the large rock by Ballachulish Bridge. Cuilcheanna The nook of the headland. Dail na Mine The field of the meal. Druim na Birlinn A ridge of the galley, either because of the shape, or because the birlinns or galleys used to come up the loch to here. Gleann Seileach The willow glen. Righ King Inchree, the meadow of the ridge or slope. Innis na Birlinn A meadow of the galley. Ceann Loch Liobhann Kinlochleven, known to Gaelic speaking people as Ceann Loch Mor, the head of the big loch. The other side of the River Leven was Ceann Loch Beag until the village of Kinlochleven was built at the beginning of the century for housing people working in the then newly built aluminium factory. The aluminium factory is now closed. Làirig Mòr The big pass. (Am Bodach, the old man, is opposite B. na Caillich) The old woman. Linnhe Dubh The dark pool, (the upper section i.e. Corran to Fort William. An Linnhe Seileach Linnhe Sheilach, the willow pool, or Linnhe Sàlleach, the brackish pool (the lower section of Loch Linnhe). Màm na Gualainn The round hill of the shoulder. Allt Nathrach Nathrach Bridge, appears to mean Adder burn, but is actually Alltan Darach, oak tree burn. Onich Place of froth, or frothy milk, presumably a frothy beach. In old records ‘offanich’. Sealladh Cùil Literally ‘back view’. This road becomes a forestry path further up the glen and leads to Lundavra. Tigh na sleubhaich The house of the gully place.